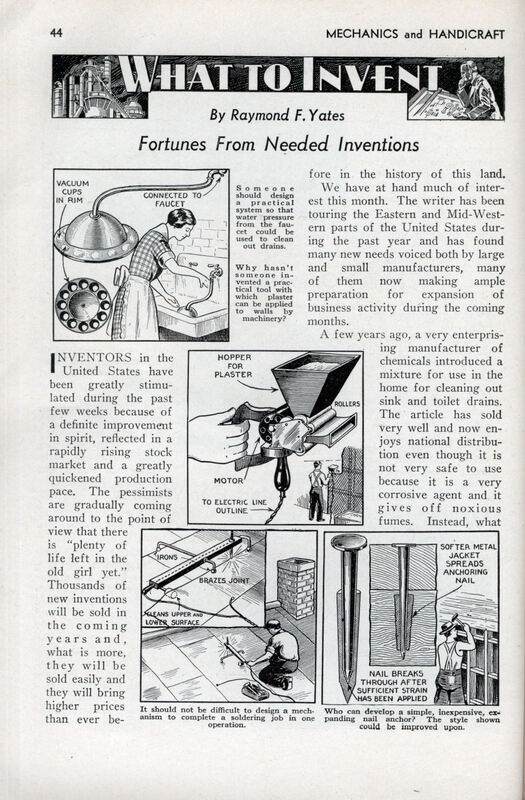 INVENTORS in the United States have been greatly stimulated during the past few weeks because of a definite improvement in spirit, reflected in a rapidly rising stock market and a greatly quickened production pace. The pessimists are gradually coming around to the point of view that there is “plenty of life left in the old girl yet.” Thousands of new inventions will be sold in the coming years and, what is more, they will be sold easily and they will bring higher prices than ever before in the history of this land. We have at hand much of interest this month. The writer has been touring the Eastern and Mid-Western parts of the United States during the past year and has found many new needs voiced both by large and small manufacturers, many of them now making ample preparation for expansion of business activity during the coming months. A few years ago, a very enterprising manufacturer of chemicals introduced a mixture for use in the home for cleaning out sink and toilet drains. The article has sold very well and now enjoys national distribution even though it is not very safe to use because it is a very corrosive agent and it gives off noxious fumes. Instead, what is required is a sort of simple hydraulic trap cleaner. But what do we mean by a hydraulic trap cleaner? Every city water supply system produces a pressure of from between 50 and 70 pounds to the square inch at the mouth of the faucet. This is quite a force. If we could cause a stream of water, under such pressure, to flow through drains, it would be a simple matter to keep them clean. To do so, we would need some sort of a simple pipe or tube which could be connected directly between the screen over the drain of a sink and the nozzle of the faucet. Thus would we be able to permit the high pressure stream of water to pass directly into the outlet of the sink. If this article could be made to sell for 50 cents, a fortune of $100,000 in royalty might be collected easily within two or three years of its appearance. Along with the popularity of waxed hardwood floors has come the so-called dust mop to take the place of the old-fashioned straw broom. Such a mop is usually kept moist with some sort of an oil so that it will catch all lint and thread. This is very fine until it becomes necessary for the housewife to clean the mop or shake it out. It would seem that here is a need for a simple combing device which could be attached permanently to the handle of the mop and would comb through the strands and remove most of the lint and dirt. This would be a big boon to housewives. If the embryo inventor does not believe this, let him ask a woman who uses such a mop. Gradually, but surely, the hand-controlled power machine is entering the various trades and crafts. 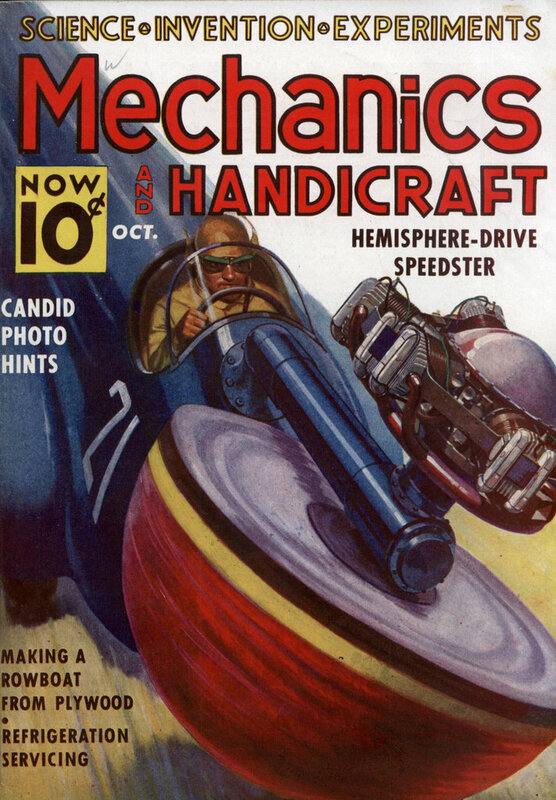 The carpenters now have power hand saws and motor-driven planes. Several manufacturers at the present time are looking for a practical plastering machine which may be operated by a novice and would lay plaster at high speed over wire mesh (now employed in place of lath). The machine should be provided with a little hopper into which the fresh mix could be fed. Writing further of machinesâ€”we should be reminded that roofers, especially those laying galvanized iron and tin roofs, would welcome an automatic soldering machine which could be run along the seams three or four times faster than is now done by hand. In the case of putting large roofs in place, most of the labor involved is charged against soldering. The machine should be able to scrape the surface clean, apply the flux in a thin layer and put the solder in place all in one passage over the joint or seam. This problem has nothing essentially difficult about it. It is just a matter of good machine designing. For many years, the manufacturers of wire nails have been looking for a nail which would be able to expand as it is driven into wood. Those who have made work-benches, using nails instead of bolts, know that eventually the nails work loose. Properly expanded nails would not show this tendency. Naturally, such a nail must be just a common nail treated mechanically in some fashion so that it will tend to expand a small fraction of an inch while it is being driven home. In other words, costs of production must not be much greater than they are at present. Right now the United States Patent Office is swamped with inventions applying to photography. Anything along this line, at the present time, finds a ready market. What the” ordinary photographer needs, and needs badly, is a little twenty-five cent article which could be attached to ANY ordinary camera and would prevent making double exposures, or taking one picture upon another on the same film section. The more expensive cameras are so arranged that this annoyance need not be experienced. Such an invention should be worth at least $25,000 cash. Some years ago an enterprising manufacturer brought out a thumb tack manufactured with a single stroke on a punch press. It was a one-piece article and a very fine idea, except that the tack “couldn’t take it.” The point broke off after it was used a number of times. However, there is still a great need for such an articleâ€”not a mechanical need but a commercial need. If the right kind of a tack could be made by a single wallop on a punch press, the cost of production would be greatly lowered, inasmuch as a gang die could probably cut out as many as one hundred tacks or a box full at every stroke. With a royalty of a penny a box, the inventor could “go to town” in fine style. Spray painting equipment is coming into use more and more each year. It has reached a point in its perfection now where it becomes distinctly possible to do away with the painter himself in case of large flat surfaces to be given a priming coat. To analyze the problem, let us assume that we have before us a large wall of a factory, say about 1,000 feet long and 20 feet high. It is not difficult to visualize some sort of a metal track framework placed against this wall so arranged that the painting machine, or spray gun, would start out at the bottom of a vertical track, move upward to the top of the frame, shift over to another adjacent track and go down, repeating the same operation over and over again. When the surface covered by the framework was painted, then the frame would simply be moved on. Finishing touches could be done by hand. This is something to think about, and here again, most of the problem appears to involve mere designing. Ask any woman who operates a domestic sewing machine and she will admit that she would like to have an attachment which would help her to stitch in a perfectly straight line automatically. A very fine seamstress is required for such work. However, there appears little reason why, in this machine age of ours, we should not have a simple device to permit this being done without trouble. We have millions of sewing machines in use at the present time and it would seem that a simple attachment which would do the trick on any make of machine would be the right answer. With so many public buildings using highly waxed floors and electric floor waxers, it would seem that it was about time that some alert inventor supplied a new method of feeding wax to such machines so that the brushes would pick it up and distribute it to the floor in a perfectly uniform film. Much remains to be done by way of improving equipment of this sort. Some years ago a rubber trousers belt was manufactured, but the men who bought and used it were not satisfied either with its life or its action. The advantage claimed, of course, was that it would at all times automatically adjust itself to the girdle. This was true enough, but most people don’t like the pressure; it could not be adjusted. Consequently, there is still a fine market awaiting a truly non-rubber self-adjusting belt of stylish design, which would expand or contract properly, and yet allow for some modification of the tension. The article should be light, should not cost much more than the ordinary belts now in use, and should be more comfortable to wear. Except for the plastering machine (which was rendered unnecessary by the invention of sheetrock) these have almost all been invented in one form or another. Cool, except for the middle initial that is my little brothers name.